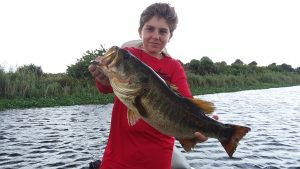 Day 3 with Andrew and his dad Kevin and Andrew lands this 6 lbs 7oz. lunker! The wind was howling 25mph today but we caught several fish this being the biggest of the day and the biggest of the trip. Thank you for coming guys and look forward to seeing you next year!